The special events at Walt Disney World can make your Disney vacation even more, well, special! From runDisney to Epcot’s Food and Wine Festival to Mickey’s Very Merry Christmas Party, WDW has a ton of events going on throughout the year. Some require an additional ticket, but some events are included with park admission. Features the Disney World Marathon, Half Marathon, Goofy’s Race and a Half Challenge, WDW 10K, Family Fun Run 5K, Dopey Challenge, runDisney Kids Races, Pasta in the Park Party, Cool Down Party at Downtown Disney, and Disney’s Health & Fitness Expo. For more info and registration, check out runDisney.com. Features the Disney Princess Half Marathon, Enchanted 10K, Glass Slipper Challenge, Princess 5K, Pasta in the Park Party, runDisney Kids races, and Race Retreat. Each Spring, Epcot is transformed with over 30 million flowers. Featuring character topiaries, food booths, HGTV seminars, and the Flower Power Concert Series, Epcot is a fantastic park to visit in the spring. Check out our impressions of the Epcot Flower and Garden Festival. Witness the power of the Dark Side and the power of your legs as you race across Disney World with members of the Empire and First Order flanking the course. 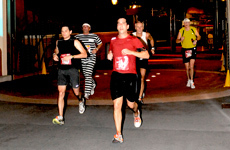 Events include the Star Wars Half Marathon, Star Wars 10K, Star Wars 5K, and runDisney Kids Races. For more information and registration, go to runDisney.com. Boo to you! For some spooky Halloween fun that’s appropriate for all ages, check out Mickey’s Not So Scary Halloween Party. Highlights at this ticketed event include HalloWishes, Trick or Treat trails, and the Boo To You Halloween Parade. Check out our Guide for Mickey’s Not So Scary Halloween Party. The Epcot International Food and Wine Festival is one of our absolute favorite times to visit Walt Disney World. With International Marketplaces featuring delectable small bites from around the world to special dining events, this event is a foodie’s dream. Check out our Guide to the Epcot International Food and Wine Festival for more information. Here’s the 2016 Eat to the Beat Concert Lineup. Merry Christmas! For some extra holiday cheer, check out Mickey’s Very Merry Christmas Party. Featuring special Christmas fireworks (among the best we’ve ever seen), a Christmas parade, and complimentary cookies and hot cocoa for guests, this ticketed event will put everyone in your party in the Christmas spirit. Check out our Guide for Mickey’s Very Merry Christmas Party.